Omensight is a hidden gem among indie games. Bringing to the table pliable combat, an engaging story, and stunning visuals to complete a package that sits quite complacently at the head chair. In Omensight you play as the Harbinger, the savior sent to prevent the world’s apocalypse. You gain control over time to repeat the same day—like Groundhog Day—as you investigate the events that summon the evil creature Voden and trigger the end. Players also uncover the truth of Godless-Priestess Vera’s murder using four central characters’ pasts. The Harbinger doesn’t choose sides in the war, forcing you to face enemies from both sides and focus on your supernatural calling. Combat utilizes the mouse for light attack and heavy attacks. Light attacks work on weaker enemies, while heavy attacks help break shields and do area damage. Your arsenal of powers increases with your level, spicing up gameplay. These powers range from a time sphere, energy blast, telekinesis, and lightning fast sword strikes. 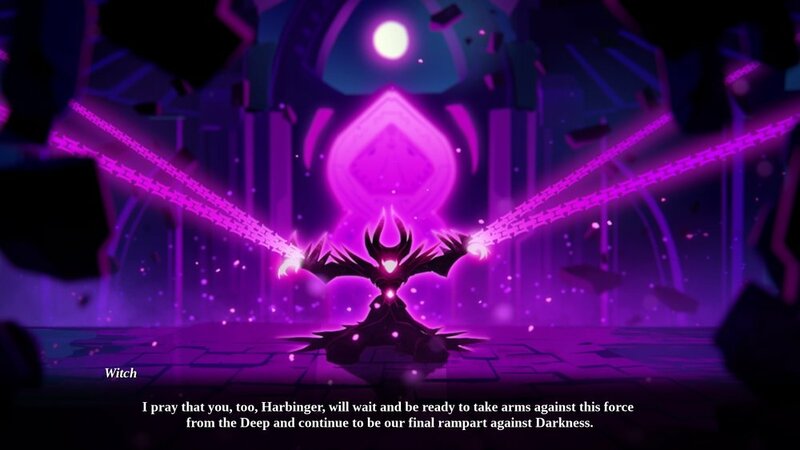 At higher difficulties, enemies become more robust and frequently attack, speeding up the pace of combat and allowing for new combos, especially through the Harbinger’s time sphere, or “Delay of Combat” ability. While in the sphere, everything slows down but you—this includes your abilities. Firing off multiple energy blasts or detonating an explosive all but freeze in time, only to speed up again and decimate any targeted enemies. Without the sphere, you can dodge attacks and counter, all the while being cautious of where your movement is going to take you next. Tactical planning and positioning come in handy when fighting the different enemies in the game and this extends into the use of a companion that accompanies you throughout a majority of Omensight. Companions that fight with you and have unique abilities inside and outside of battle. Learning to move with a mouse and keyboard can be difficult at first and is one of the only things that might put a damper on gameplay. The game highly recommends using a controller, to allow for more fluid movements and positioning. A single button on the keyboard moves forward and players point the mouse in the direction they want to run. Combat can get hectic and you might lose your place, but it’s easy to adapt after a few tries. Omensight uses a traditional apocalyptic scenario to start the game, but you play a supernatural being instead of a regular hero aiming to stop the blight that is covering the land. The Harbinger doesn’t engage itself in the affairs of the ordinary creatures of the world. Instead, it is guided by its mission and shows no qualms about not doing anything of its own free will and volition. The Harbinger merely pushes forward regardless of if yesterday's friend is today's enemy. It must complete the mission it was made to do. The game even seems to pull mythology into the mix in a few different forms. The entire game gives a Norse-like feel of Ragnarok to it, even in the level design. But it also draws from Egyptian mythology, mainly the world-ending snake Apophis inspiring the terrifying Voden. Whenever Voden appears you always feel a sinking feeling in your gut and question whether or not you are going to make it. The game offers no time limit or cut-off for the number of times you can jump back to the past, leaving players to contend with their own failures. 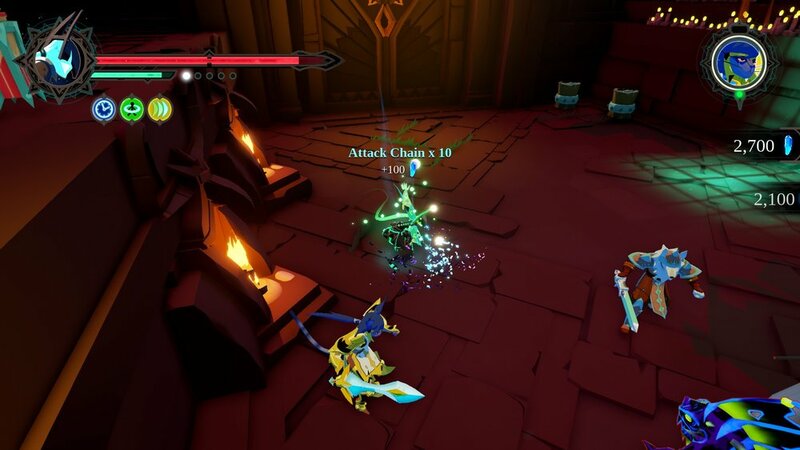 Omensight uses the Unreal Engine, and the developers had no issues pushing it as far as possible. The bright palette that turns to dark as Voden takes over represents the passage of time and drives home the feeling of doom. However, the brightly lit neon blue Harbinger brings light to all situations where you find yourself stuck. Flashing bright blues, whites, and yellows while you defeat foe after foe and watch them fade into dark dust, delivers a strong sense of satisfaction and total power. The world itself is vibrant and seems to come alive right off the screen. Even though the game’s art doesn’t focus on realism, the attention to detail is apparent when visiting places like the forest, dungeon, or your home base where you can upgrade your character and view the progress of your investigation. Omensight is engaging and grabs the player for a wild ride that changes depending on how they use insights to interact with characters in the past. The combat allows for great gameplay that isn’t overbearing or too simple to just run through. Sword fighting is an absolute joy once you unlock powers and figure out your fighting style for different situations. All of this is accompanied by immersive graphics that captivate you with bright colors and jolting flashes of light. Omensight is a title worth having in your repertoire of memorable indie games. It offers something fresh and fun with fluid combat, a vibrant world, and compelling characters.